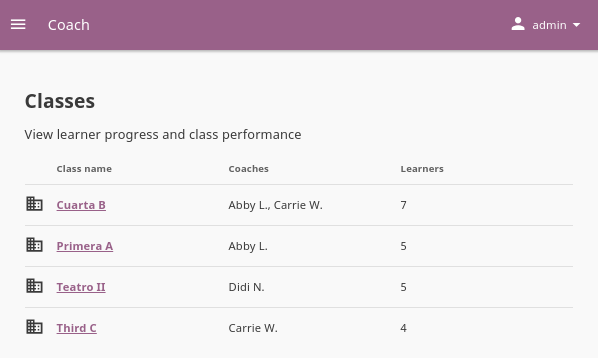 You can track progress of the Learners, create and assign Lessons and Quizzes to classes or learner groups from the Coach dashboard. The default view of the Coach dashboard presents the list of Classes with their assigned coaches, and the number of learners enrolled in each class. 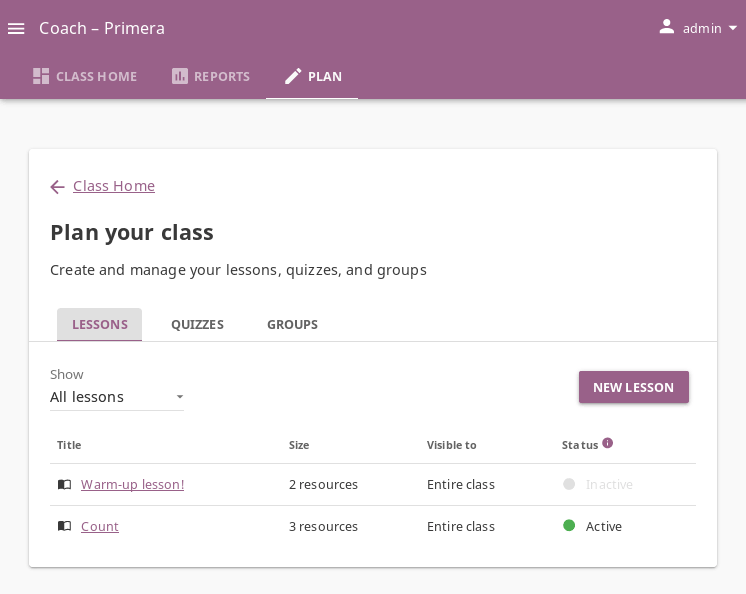 Click on a class to access the progress-tracking features and create lessons, quizzes and groups. Choose one of the classes from this view to access the Kolibri coach features. 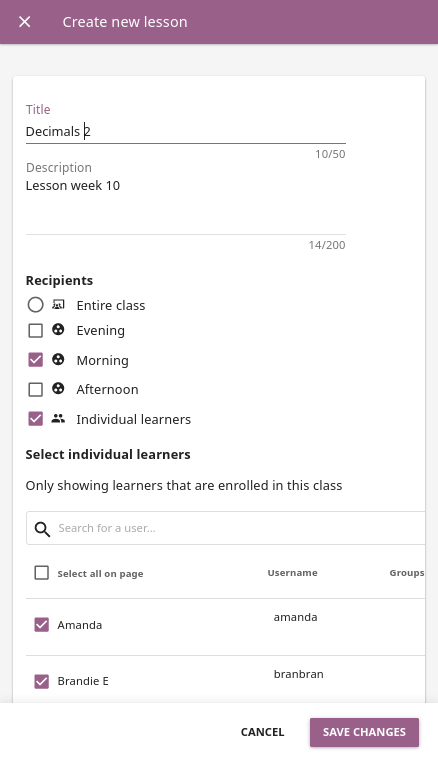 On the Class Home tab (dashboardClass home icon) you can see the overview of the class activity and track progress of the learners on lessons and quizzes assigned to them. Class Home presents an overview of learner progress and activity. You can review the progress of learners on the assigned quizzes in the Quizzes assignment_lateQuizzes block. Progress bar will indicate how many learners have started scheduleStarted and completed starsCompleted the quiz. You can click on the progress bar to open the complete quiz data in the Reports tab. Click VIEW ALL to access the full list of notifications about quizzes (only the 3 most recent are displayed in the block). Quizzes were known as Exams in Kolibri versions prior to 0.12. You can review the progress of learners on the assigned lessons in the Lessons import_contactsLessons block. Progress bar will indicate how many learners have started scheduleStarted and completed starsCompleted the lesson, and if they need help errorNeed help with some of the resources in it. You can click on the progress bar to open the complete lesson data in the Reports tab. Click VIEW ALL to access the full list of notification about lessons (only the 3 most recent are displayed in the block). 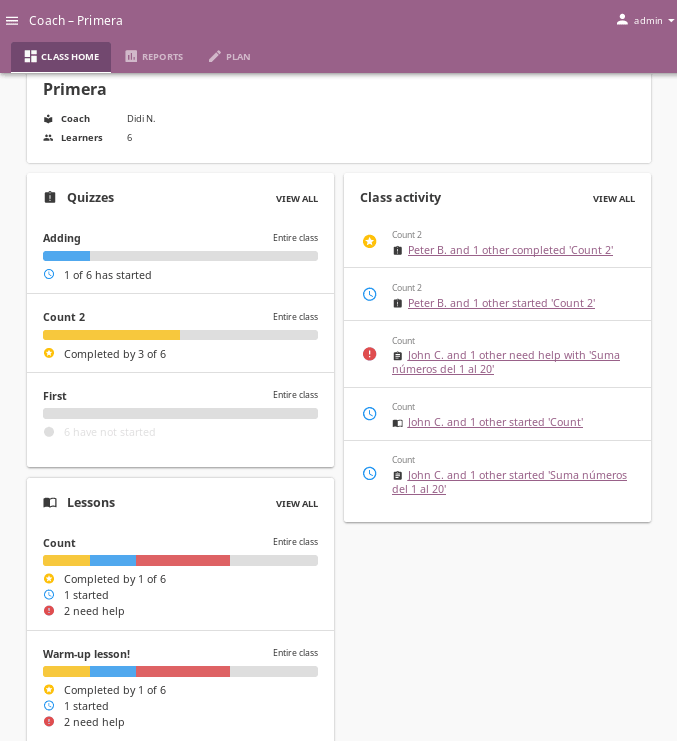 As learners interact with lessons and quizzes, you can track their progress in the Class activity block. 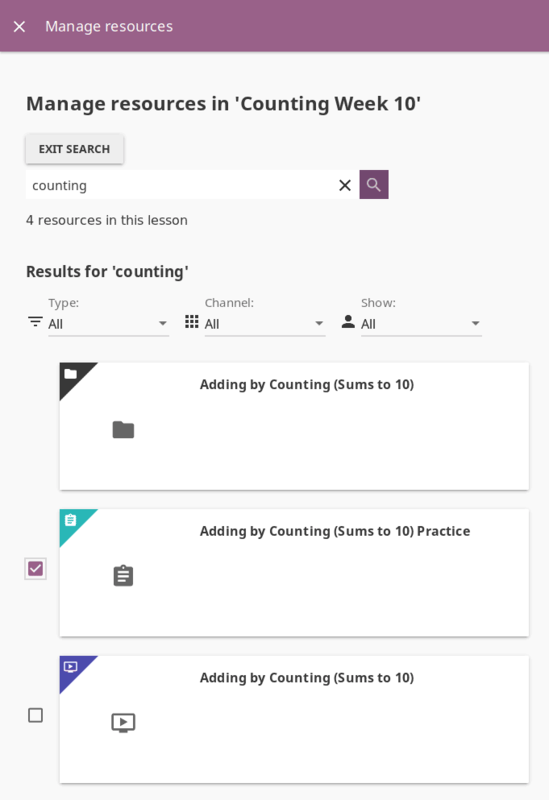 When learners start or complete lessons, you will see one notification displaying the title of the lesson they started scheduleStarted or completed starsCompleted, and another displaying the title of the specific resource in the lesson they interacted with. In case of quizzes, you will see only the quiz title notification. When learners input multiple incorrect answers to a question in a lesson, the notification in the Class activity block will display that one or more learners need help errorNeed help with a specific resource. You can click each notification link to review the complete resource data in the Reports tab. Click VIEW ALL to access the full list of activity notifications (only the 5 most recent are displayed in the block). Reports tab (assessmentReports icon) allows you to gain insight into detailed real-time progress of the learners for single resources in lessons and quizzes assigned to them. Kolibri presents actionable reports for each lesson and quiz the class learners have been assigned, together with the possibility to observe the progress by groups and individual learners. Open the Lessons sub-tab from the main Reports view to access the progress reports on resources included in each lesson. To review past lessons, use the filter to include only the Inactive lessons. Progress column presents the summary of learners who started scheduleStarted and completed starsCompleted the lessons, or need help errorNeed help with some of the included resources. Click on the lesson title to view its list of resources. In the selected lesson Report sub-tab, you can see the clickable list of resources, with their own progress and the average time spent on. When you click to open the single resource, you can see the progress report for each learner (started scheduleStarted, completed starsCompleted or need help errorNeed help), and the time spent on it. If the resource is an exercise, you can access the Difficult questions sub-tab and review each attempt with incorrect answers. Open the Learners sub-tab to access the progress report per each learner. Open the Quizzes sub-tab from the main Reports view to access the progress reports on resources included in each quiz. To review past quizzes, use the filter to include only the Inactive ones. Progress column presents the summary of learners that started scheduleStarted and completed starsCompleted each quiz. Click on the quiz title to view its list of resources. In the selected quiz Report sub-tab, you can see the list of learners, with columns for the progress and obtained score. Open the Difficult questions sub-tab to view the list of questions learners gave incorrect answers to, and gain insight of how many need help errorNeed help with the concept. Click a difficult question in the list to review each of the incorrect answers and attempts. When you click a name of a single learner, you can see the full report for each answer. This can help you understand which questions learners had difficulties answering correctly, and how many attempts they used. Click on the attempt icons to see the answers for each one. 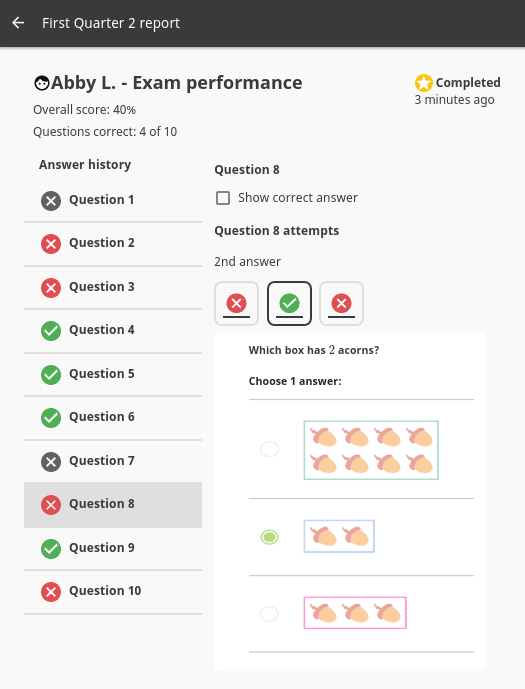 In the screenshot above learner Abby L. had 3 attempts on Question 8: the first one was incorrect, the second one (selected) was correct, but the third and finally submitted one was incorrect. 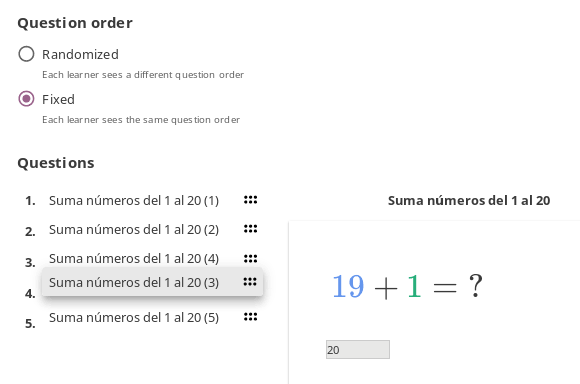 When a learner answers exercise questions in Kolibri, the progress bar below the exercise is taking into account only the most recent given answers, meaning that the learner must complete the required number of correct answers (check marks) in the row for the exercise to be considered completed. The correct answers (green check marks) in the image above are not in a row; this exercise will be completed only after the learner gives 5 correct answers one after another. Open the Groups sub-tab from the main Reports view to access the reports about the progress in lessons and quizzes per each group. In the main view you can see the table with summary of lessons and quizzes assigned to each group, number of learners and the last activity. Click on group name to view its detailed progress report. From the group Reports sub-tab you can click to access each lesson and quiz. In the Members sub-tab you can view the summary of completed exercises, scores and viewed resources for each group learner, and click to access their full progress report. Open the Learners sub-tab from the main Reports view to access the progress report per each learner. 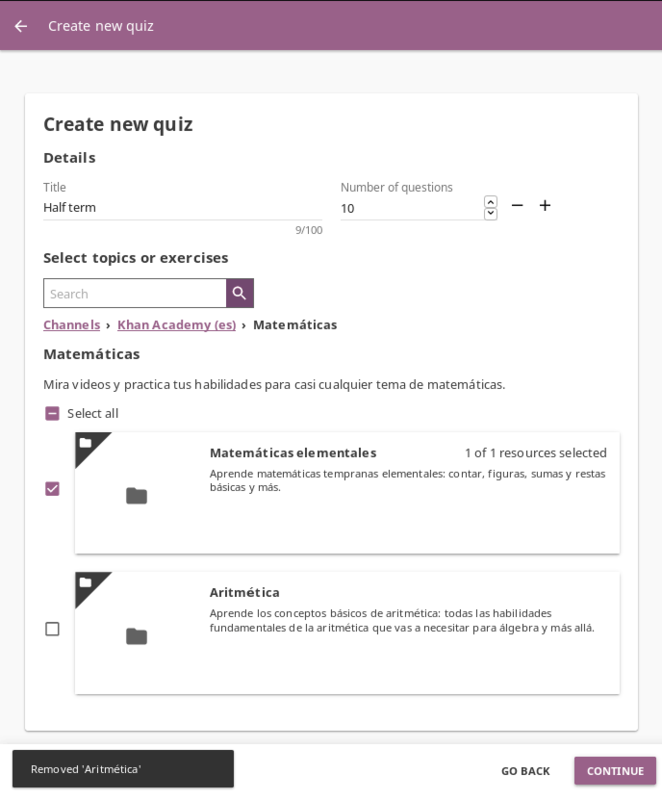 In the main view you can see the table with summary of completed exercises, scores and viewed resources for each learner, and their last activity. Click on learner name to view their detailed progress report. From the learner Reports sub-tab you can click to access each lesson and quiz. In the Activity sub-tab you can review their activity on resources assigned. 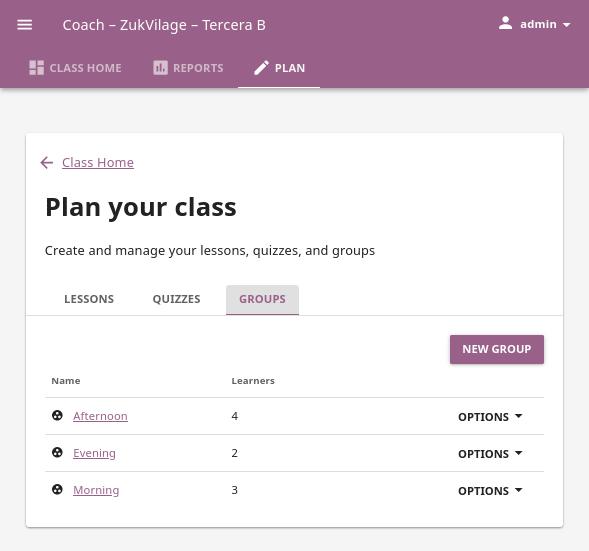 Use the options in the Plan tab to create and manage the lessons, quizzes, and groups for the selected class. Kolibri Lessons offer you the possibility to prepare smaller selections of available learning resources and assign them to learners on a temporary basis. 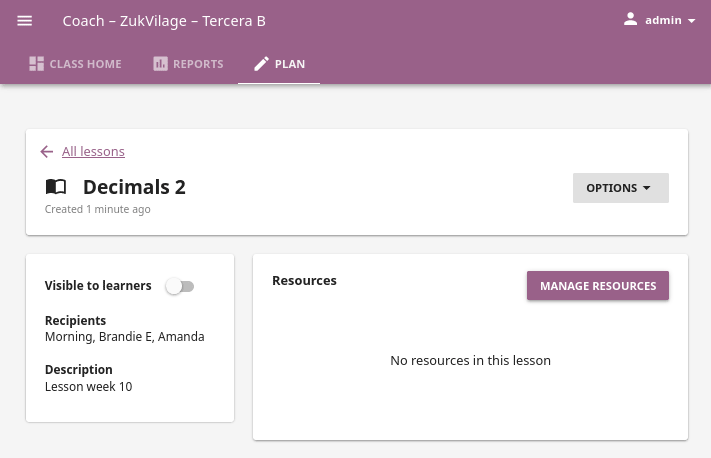 You can select resources from multiple channels, and copy the created lessons to other classes or groups as needed. To view, create or delete lessons, as well as assign them to learners, use the Lessons sub-tab in the Plan tab (createEdit icon) of your Coach dashboard. 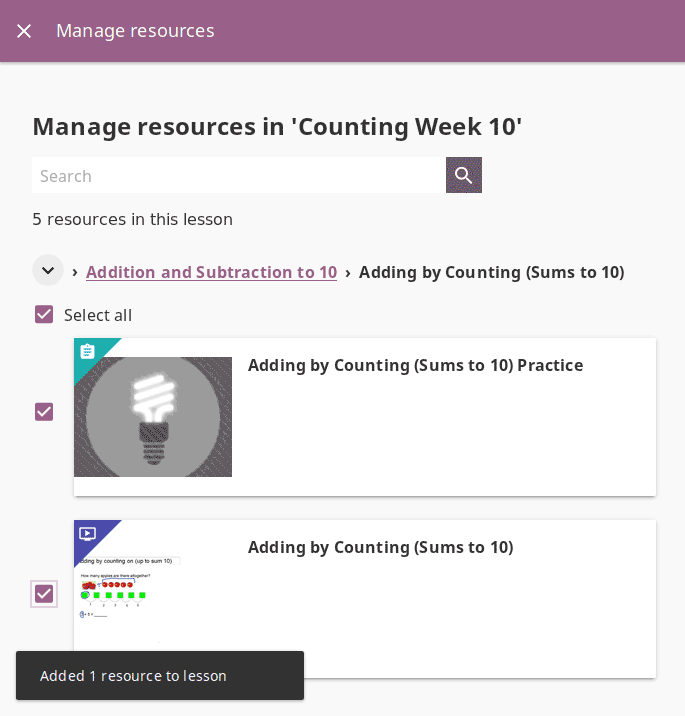 Default view displays the list of all lessons created for the selected class, the number of resources they contain, groups they are assigned to, and their status indicator. You can filter the lessons in order to see all, or just active/inactive ones. To manage import_contactsLessons Lessons in Kolibri classes and groups, you must sign in as coach, admin or super admin. To create a new lesson import_contactsLessons, follow these steps. Click the NEW LESSON button. Fill in the field for the lesson title, description and choose the group(s) or the entire class as the recipients. Click CONTINUE. In this step, the lesson does not have any learning resources yet, but you can see and edit some options. 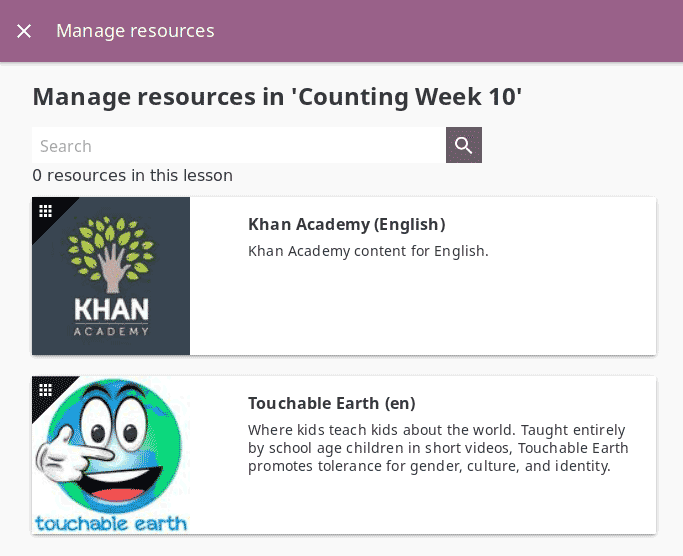 Click MANAGE RESOURCES and select the content channel from which you wish to select resources for the lesson. Keep navigating the topic tree of the selected content channel until you arrive to single content items. Use the checkboxes to select the resources you want to include in the lesson, and you will see a notification at the bottom of the page that the resource has been added. Use the Search feature to look for resources about a specific subject. Write the search term in the field, and press the ENTER key or click the searchStart search button to display the results. When you finish, press the EXIT SEARCH button to return to the list of selected resources. You can filter the search results by type of resource (video, document, exercise…), include only those from a specific channel, or exclude resources for coaches. Press the FINISH button to close the Manage resources window and return to the main view of the lesson. You will see a confirmation notification at the bottom every time you change something in the lesson. To add more resources to the same lesson and keep editing if needed, follow the steps 4 to 9 again. A newly created lesson is Inactive by default, meaning that learners will not see it in their Learn view. To change the lesson status, follow these steps. Click the Change link under the Status heading. Click SAVE to confirm, or CANCEL to exit without change. You can change the visibility of the lesson that you set when you initially created it. To reassign the lesson to a different group or the entire class, follow these steps. Select the desired lesson from the list in the Lessons tab. Click OPTIONS and select Edit details. Select Entire class or the group(s) of learners to whom you wish to assign the lesson under the Visible to heading. To copy a lesson to a different group or another class of your facility, follow these steps. Click OPTIONS and select Copy lesson. Select the class to which you wish to copy the lesson to. If the destination class has more than one group, select Entire class or the group(s) of learners to whom you wish to assign the lesson. If the lesson is copied to another group in the same class, it will appear in the Lessons tab as the Copy of…. Follow the steps in the next heading to rename it. To rename a lesson, follow these steps. Change the lesson title in the confirmation window. Click SAVE to confirm, or CANCEL to exit without renaming the lesson. To delete a lesson, follow these steps. Click OPTIONS and select Delete. Click DELETE in the confirmation window to proceed, or CANCEL to exit without deleting the lesson. 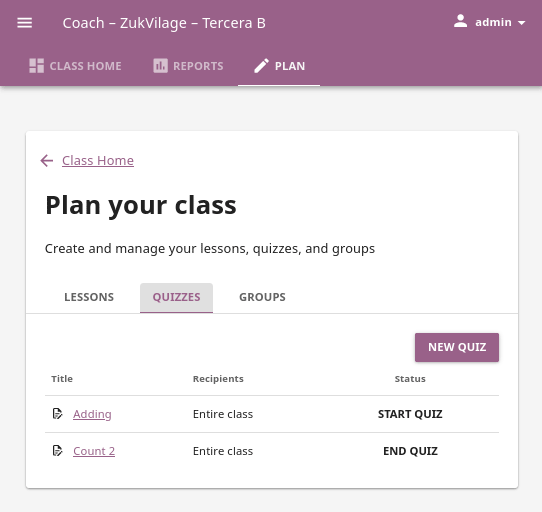 You can view, create and delete quizzes, as well as assign them to learners, using the Quizzes sub-tab in the Plan tab (createEdit icon) of your Coach dashboard. The default view displays the list of all quizzes in a selected class, with indicators of their visibility status and groups they are assigned to. To manage Quizzes assignment_lateQuizzes in Kolibri classes and groups you must sign in as coach, admin or super admin. To create a new quiz assignment_lateQuizzes, click the NEW QUIZ button. Fill in the field for the quiz title in the Create new quiz page. Adjust the number of questions you want the quiz to contain. You can use the arrow field value modifiers with the mouse, or - and + buttons if you are using the keyboard. Navigate through the topic tree and activate checkboxes of those exercises you want to include in the quiz. As you keep adding and removing the exercises you will see confirmation messages at the bottom. Use the Search feature to look for topics and exercises about a specific subject. Write the search term in the field, press the ENTER key or click the searchStart search button to display the results. You can filter the search results by type of resource (exercise or topic), include only those from a specific channel, or exclude resources for coaches. Click EXIT SEARCH button to return to main quiz view. When you finish selecting resources, click CONTINUE button to preview the quiz. Beware that if you click the GO BACK button, you will exit the quiz builder and loose the resource selection. You can choose between Randomized and Fixed question order. 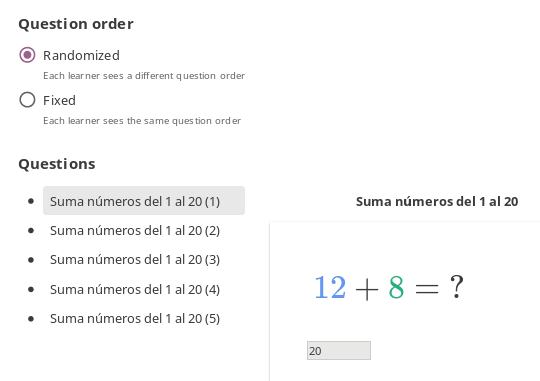 To present the questions in a different (random) order to each learner, select Randomized. To present the same (fixed) question order to all learners, select Fixed. You can reorder the questions by using the drag_indicator button with the mouse (drag and drop), or with keyboard_arrow_upArrow up and keyboard_arrow_downArrow down buttons if you navigate by keyboard. Use the option Choose a different set of questions to obtain an alternative selection of questions to display. When you are satisfied with the question order click the FINISH button, and you will see a confirmation notification at the bottom. Newly created quiz is by default visible to entire class. To change quiz Visibility, that is select group(s) of learners instead of the whole class, follow these steps. Click OPTIONS button for the desired quiz and select the Edit details option. Select the group(s) of learners to whom you wish to assign the quiz under the Visible to heading. Newly created quiz is by default not active. 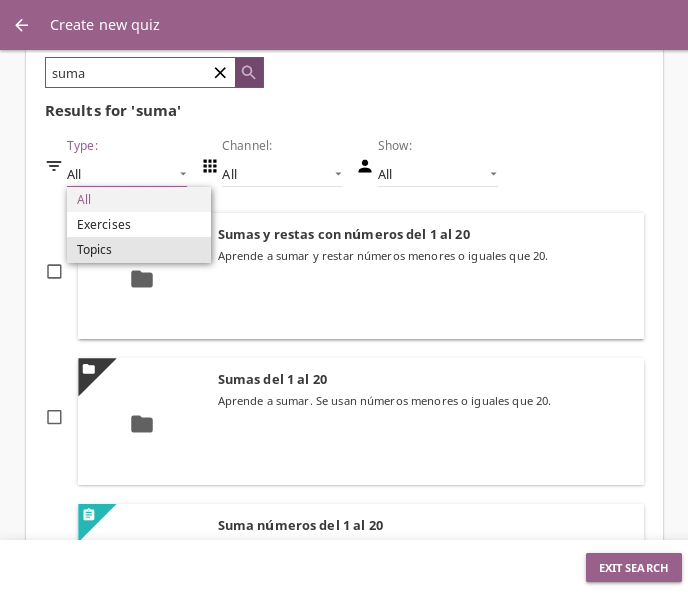 Once you set the visibility of quiz to the chosen group(s) of learners, you need to Activate it so it can appear in the Learn view of the learners it is assigned to. Select Active at the start of the quiz period. When the quiz period concludes, select the Inactive option. To copy a quiz to a different group or another class, follow these steps. Click OPTIONS for the desired quiz and select Copy quiz. Select the class to which you wish to copy the quiz to and click CONTINUE. Click COPY to confirm, or CANCEL to exit without change. If the quiz is copied to another group in the same class, it will appear in the Quizzes tab as the Copy of…. Follow the steps in the next section to rename it. To rename quiz, follow these steps. Click OPTIONS for the desired quiz and select Edit details option. Change the quiz title in the confirmation window. Click SAVE to confirm, or CANCEL to exit without renaming the quiz. To delete quiz, follow these steps. Click OPTIONS for the desired quiz and select Delete option. Click DELETE in the confirmation window to proceed, or CANCEL to exit without deleting the quiz. All data from the quiz you are deleting will be lost. In case you need to further divide learners inside classes, for example to address the different progress needs, you can use the Groups feature. Create and delete groups, as well as assign learners to them from the Groups sub-tab in the Plan tab (createEdit icon) of your Coach dashboard. 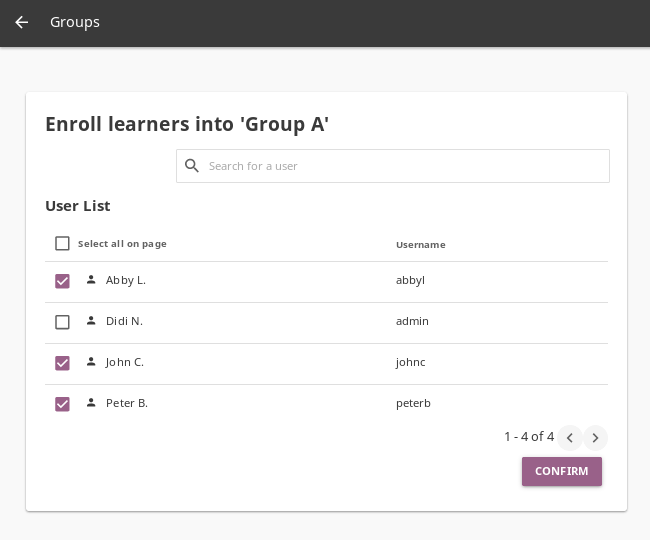 Default view displays the list of all groups for the selected class, with the number of assigned learners for each group. To manage Kolibri groups you must sign in as coach, admin or super admin. To create a new learner group, follow these steps. Give group a desired name. Click SAVE to confirm, or CANCEL to exit without creating a group. Click to open the desired group in the Groups sub-tab. Click the ENROLL LEARNERS button. List in this view contains all the learners currently not enrolled in the selected group. 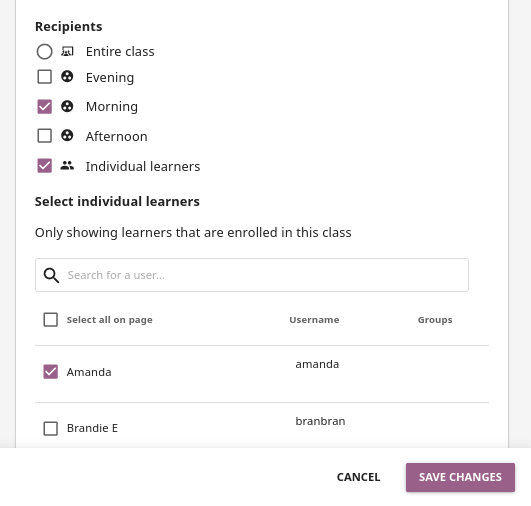 Use checkboxes to select all the learners in the list, or the search field for specific learners you want to enroll in the group. Click CONFIRM to finish enrolling the selected learners and return to the group page. To rename group, follow these steps. Click OPTIONS button on the right edge of the desired group. Input the new name for the group in the confirmation window. Click SAVE button to proceed, or CANCEL to exit without renaming the group. To delete a group, follow these steps. Click DELETE button in the confirmation window to proceed, or CANCEL to exit without deleting the group. 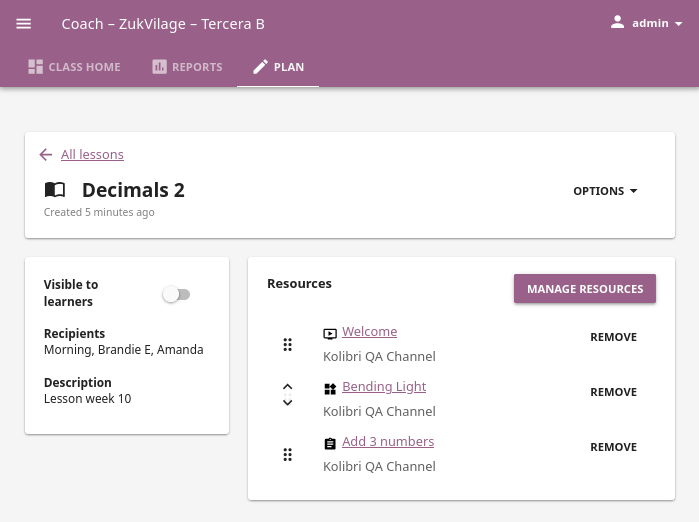 Kolibri Studio supports the option to set visibility for any resource added to content channels as a Coach resource. 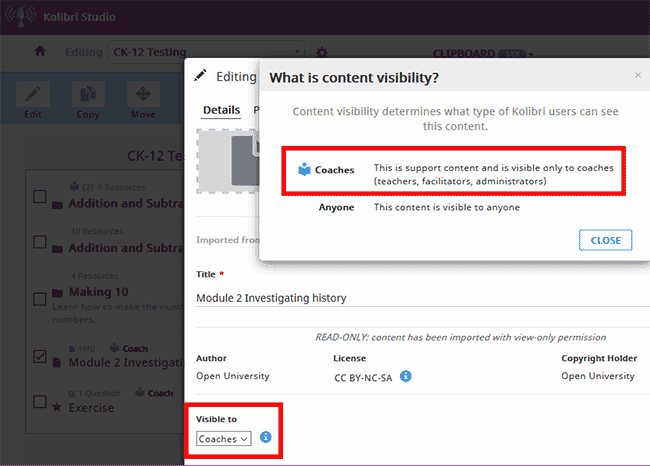 When content curators set the visibility this way, the resource in Kolibri will not be visible to learners, but only to admins, facility coaches, or other users assigned to coach classes. These materials can be lesson plans, professional development readings, training materials, etc. only viewable by coaches and not learners. Setting the visibility of content in Kolibri Studio. Coach resources and content channels that contain them are marked with the local_libraryCoach resource icon in Kolibri. Content channel with 4 support resources for coaches in Kolibri.